Ironing Service in a Box - What's in the Box? 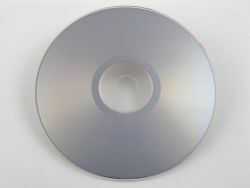 The CD contains files and templates ready to use on your PC, including a simple price list spreadsheet plus artwork, including 'terms of business' and' welcome pack' - all of which can be customised to your business requirements. 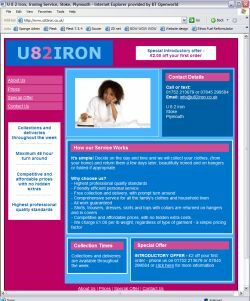 A web designer could charge you several hundred pounds for a website alone - but with our Ironing Service in a Box it's included in the price. 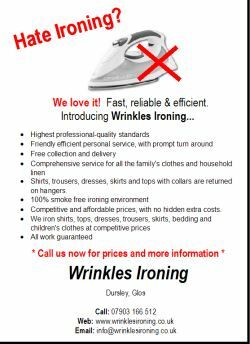 Plus, you get your own web address / domain name and we promote it on our nationwide ironing directory and on Google - so you'll get new customers quicker. Leaflets are a great way to get sales. Our Ironing Service in a Box comes with 500, 2 colour A5 leaflets, customised for your business. The design is tried and tested and optimised to get you new customers. 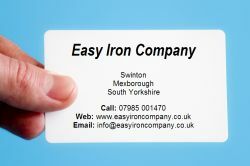 Our Ironing Service in a Box also includes 100 business cards for a professional image. We also include a hints and tips booklet which helps you gain new customers, whilst avoiding the pitfalls.